The legions of volunteers through the years have made a huge difference. SCARBOROUGH — As a high school student 40 years ago, Linda Woodard took part in a Scarborough Marsh nature walk led by volunteers. The sounds and smells of Maine’s largest salt marsh made an impact: Woodard went on to become the director of the marsh’s nature center. In her 25 years at that post, she’s seen the nature center thrive because of volunteers. Each year more than 10,000 visitors pass through the center. Volunteers lead nature tours on land and on the Dunstan River, rent out canoes, teach visitors about the center’s taxidermy mounts, and even repair the building. 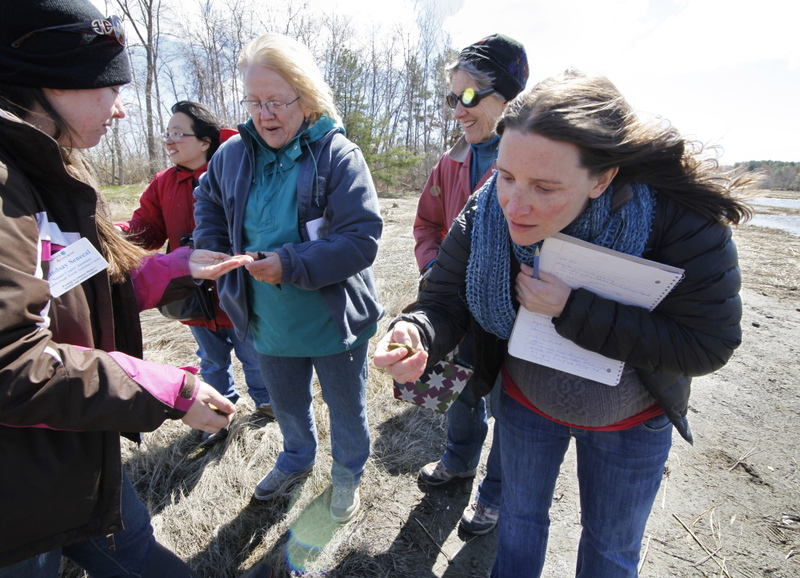 Becky Brosnan of Cape Elizabeth, right, inspects a sample of algae from the Scarborough Marsh while touring with Audubon Nature Center assistant Lindsay Senecal, left, and other volunteer naturalists during a training session. 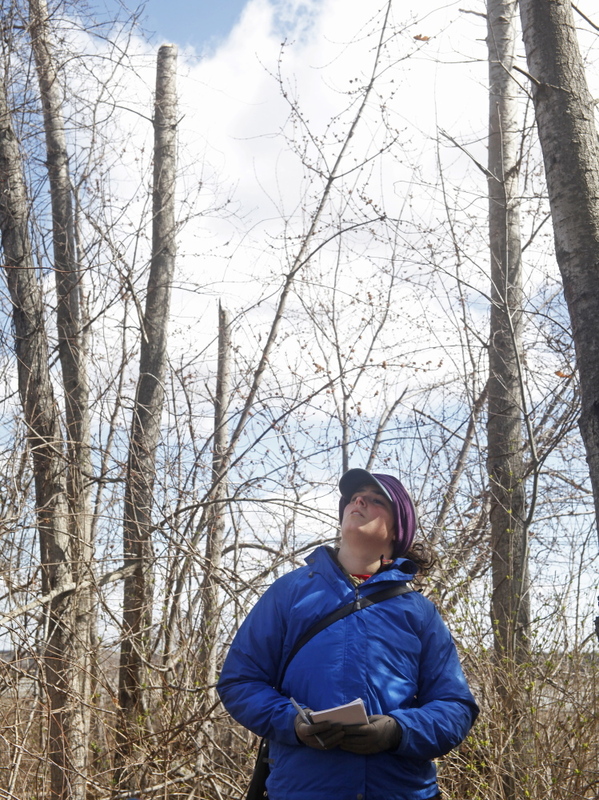 Lisa McCusker of Peaks Island ponders the invasive bittersweet in a wooded area of the Scarborough Marsh. McCusker, a recent college graduate, attended training for this year’s volunteers. The 3,100-acre marsh is home to shorebirds, raptors and ducks. The estuary is managed by the Department of Inland Fisheries and Wildlife, and includes a bike path that spans its width. Maine Audubon runs the nature center, which opened in 1972. Every year from May to September, volunteers work more than 80 hours a week. Last week, Woodard and her staff led training for this year’s volunteers, many of whom share her contagious devotion to the marsh teeming with wildlife beside busy Route 1. “I love marshes; I grew up around them. I love the idea of being outside and listening to the sounds of the marsh,” said Lisa McCusker, a Georgia native and recent college graduate who attended the training. 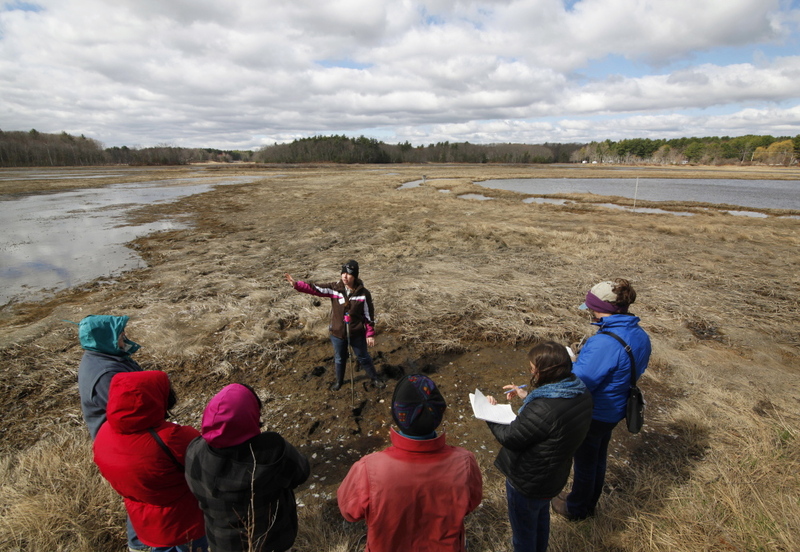 While many of Maine’s land trusts have dedicated volunteers, the Scarborough Marsh has a steady stream. When volunteers move away or move on, a new corps is always there. Without fail, the apprentice tour leaders prove knowledgeable ambassadors of the marsh by the time they lead groups on the 45-minute nature tour, said Karin Kelley, a third-grade teacher at Wentworth School in Scarborough who has been on 15 guided marsh hikes. Each spring about six nature guides are trained. They learn about the estuary’s ecology, the spongy nature of a marsh and the habits of shorebirds. Many also help staff the nature center, which was built from a former clam shack. “I’m here because Linda recruited me. But I’m glad I came,” said Susan Gilpin of Falmouth at last week’s training. Many are retired teachers. Last year for the first time, five businesses asked to devote a work day at the marsh. “I have a retired engineer who helps. He’s the first one I call when something breaks. I have a volunteer carpenter on call, and an electrician,” Woodard said. McCusker, a 2014 graduate of the College of the Atlantic, signed up to help lead nature walks with school children, but now is hoping to serve as a canoe tour leader.